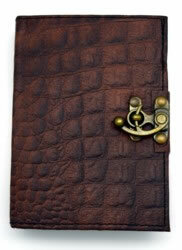 This beautiful leather embossed journal is 3.5 x 5 inches. It comes with 120 pages of premium quality handmade linen parchment paper. Comes with a metal lock to keep the journal closed. 5 x 7 inch 2 Color Tree of Life Leather Embossed Journal with Handmade Linen Parchment Paper. Comes with a metal lock closure. 5 x 7 inch Fluer De Lis 2 Color Leather Embossed Journal with Handmade Linen Parchment Paper. Comes with a metal lock closure. 5 x 7 inch Green Leather Embossed Journal with a Tree of Life Design with Handmade Linen Parchment Paper. Comes with a metal lock closure. 5 x 7 inch Hamsa Hand Leather Embossed Journal with Handmade Linen Parchment Paper. Comes with a metal lock closure.